The Russians just gave (again) a public lecture of how to handle the wannabe-Sultan Erdogan. The Turkish military launched its operations in Syria to end the rule of Syrian President Bashar al-Assad, President Recep Tayyip Erdoğan said Nov. 29.“In my estimation, nearly 1 million people have died in Syria. These deaths are still continuing without exception for children, women and men. Where is the United Nations? What is it doing? Is it in Iraq? No. We preached patience but could not endure in the end and had to enter Syria together with the Free Syrian Army [FSA],” Erdoğan said at the first Inter-Parliamentary Jerusalem Platform Symposium in Istanbul. “Why did we enter? We do not have an eye on Syrian soil. The issue is to provide lands to their real owners. That is to say we are there for the establishment of justice. We entered there to end the rule of the tyrant al-Assad who terrorizes with state terror. [We didn’t enter] for any other reason,” the president said. If Turkish troops were in Syria to remove its President, instead with the flimsy excuse of fighting ISIS under a badly fitting UN mandate, they would be a hostile invasion force and a legitimate target for Syria and its allies. The remark was thus stupid. It weakened the Turkish position. Turkish President Recep Tayyip Erdogan’s statement that his goal in Syria was to end the rule of Bashar Assad has caused consternation in the Kremlin, with officials saying it contradicted previous assurances and was out of sync with Moscow’s take on the situation.”The statement was indeed news, this is a very serious statement. [It] is in discord with the previous [statements] in general and with our understanding of the situation,” Russian presidential spokesman Dmitry Peskov told reporters on Wednesday. “We hope that in the near future there will be explanations on this from our Turkish partners,” he said, adding that Russia is the only country whose armed forces are in Syria on a legitimate basis – at the direct request of the Syrian authorities. The emphasized part is a hardly hidden direct threat. Erdogan put his forces in Syria into immediate jeopardy. Erdogan tried to save the situation, promising a retreat from his statement for at least some gain for the Jihadis he supports. Turkish President Recep Tayyip Erdoğan discussed the grave situation in the Syrian city of Aleppo with his Russian counterpart Vladimir Putin by phone on Nov. 30 for the third time in a week, with the two “agreeing on the need for a ceasefire,” presidential sources said.The sources said the two leaders agreed to step up efforts to stop clashes in Aleppo and deliver humanitarian aid to civilians in the besieged city. That was the Turkish version of the call. The Russian statement on that call was sparse and did not mention any ceasefire. 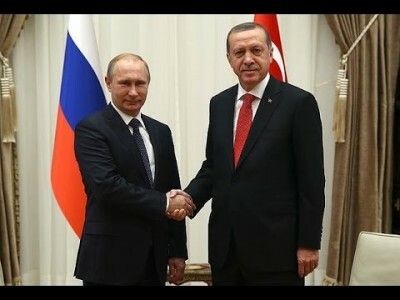 “I will take that statement back if you give me a ceasefire deal in Aleppo,” Erdogan told President Putin. “Screw you,” was the response. Lavrov said the bloodshed must stop in Syria and the region, that Moscow was ready to talk to all parties in the war, and that it would continue cooperating with Turkey. But he also vowed Russia would continue its operations in eastern Aleppo and would rescue the city from what he described as terrorists. Erdogan’s statement, aimed at his supporters in Turkey and elsewhere, created a legal mess for his troops. The attempt to sell a retreat from it for some gain was harshly rejected by Russia. Now all Erdogan could do was to take his statement back with no gain at all. This was quite a loss of face for him – a well deserved one. Turkey’s military operation in Syria is not against any country or person but terror groups in general, President Recep Tayyip Erdoğan has said, in contrast to earlier remarks that Turkey’s objective was to topple Syrian President Bashar al-Assad following.“The aim of the Euphrates Shield Operation is no country or person but only terror organizations. No one should doubt this issue that we have uttered over and over, and no one should comment on it in another fashion or try to [misrepresent its meaning],” Erdoğan said at a 30th gathering with village chiefs at the Presidential Palace in Ankara on Dec. 1. Hahaha – see how that dog pulls its tail between its legs – whining in retreat? The game Erdogan tried would probably have worked with Merkel, or some other EU politician. Russia will have none of it. No means no. When Russia says stay out of Al-Bab it means stay out of Al-Bab. With regard to Syria Erdogan now has to do what he is told to do. He was just publicly lectured about that again. Still, I doubt that he really learned the lesson.